who practice Tai Chi around the world. 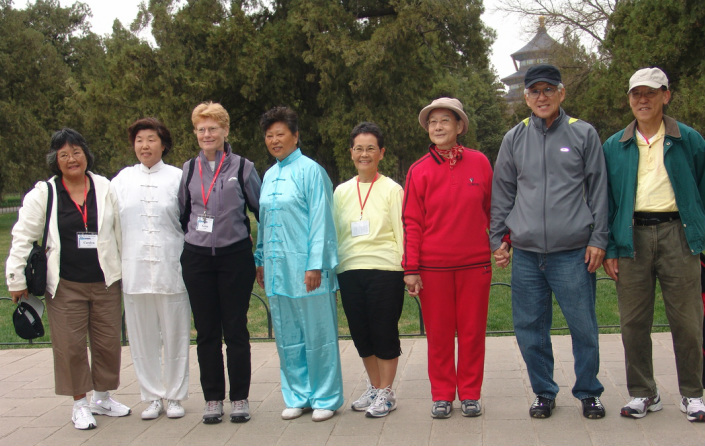 with international Tai Chi friends through the power of the internet. Who wouldn't want to be creative in the art and tai Chi with living around such beautiful surroundings.Envious. Hi Lucy and Ken although I teach qigong and tai Chi have to say how much I enjoy watching you. Your simplistic method of teaching is how it should be without rushing through.So much damage can be done without explaining how the core muscles and back move. I do the bejiing ,tai Chi for arthritis (Dr Paul lam) tai Chi for wimps(haha lovely name) tai Chi for over 55s .Qigong -8pieces of brocade,shibashi 1 and 2 and daoyin.Teach 3 times a week(enough for me).Take part in World tai Chi day- although I always forget to video! I love your 10 style form as it takes up so little room but so beneficial as all the movements are there...Wonderful age of your mother and wish her the best of health. 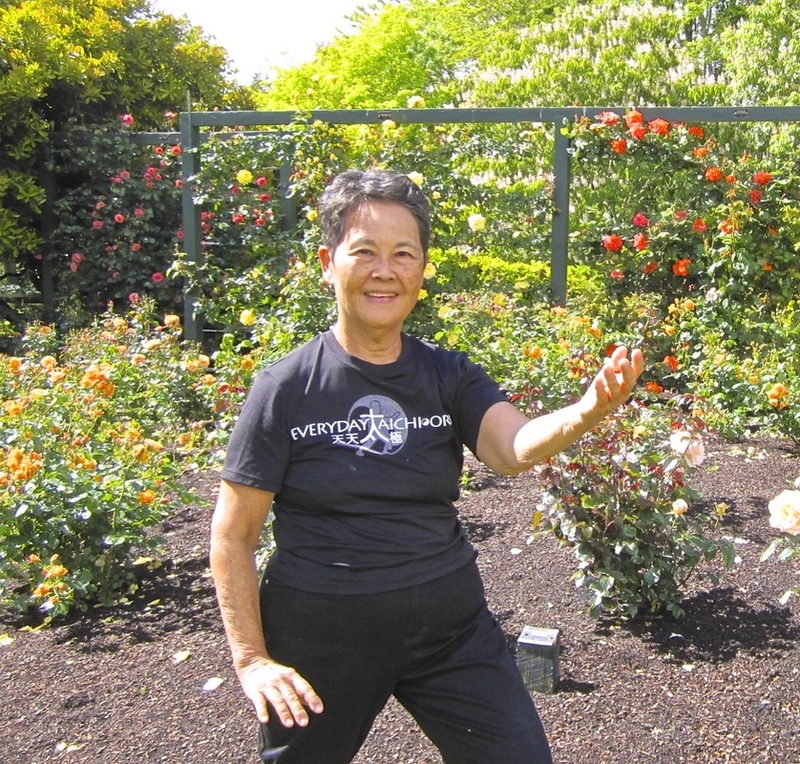 If you want to learn any tai Chi movement's watch this wonderful instructor- Lucille Chun.Teaches in simplistic style.Also watch qigong by her. I am so impressed with your video clips on you tube. Thank you so much for sharing your expertise with others. I am just beginning to learn tai chi and you are such a straight forward, tell it like it is, no nonsense, excellent teacher! I see that you have DVDs for sale. I would like to purchase the first 2 DVDs but I do not see a link to make a purchase. Please advise. Hello master Lucille, yeah!, I practiced many years with my great-grandfather( Wang Tung Hai 1848 - 19872 ) and my grandfather( Wang Xing Hua 1888 - 2007 ) both were students of Grandmaster Yang Jian Hou, now I usually go to courses Master Yang Zhen Duo every year on tour in Europe, and also I taught Tai Chi in Spain. If I ever am in Hawaii, I'm sure I'll come to meet you, thanks for the invitation and Happy New Year 2014!! The email message that appears below was sent to me by a person who has watched our YouTube videos. He lives in Spain and has studied Tai Chi from his family who learned from the Yang masters of which our Yang Style Tai Chi originates. I've seen your video is nice too see, I liked very much. I've trained Tai Chi with my grandfather ( Wang Xing Hua 1888 - 2007), he was student of Yang Jian Hou, from 1898 to 1912, for 14 year my form is a slight diferent. Right now I'm trainning with master Yang Zhen Duo, ok!, sometime when he is in Europe. Gong Xi Fa Zhai master!!!!! Re: Hi! !I am sorry to have been slow to respond to say Happy Chinese New Year 2012! !, This delay was due to lost my password, I'm sorry great teacher, but there is a saying so, But better late than never, not return to happen, I promise. Yes!, I still practice two months ago I was in a course given by the Master Yang Zhen Duo (great grandson of Yang Lu Chan) in Cologne Germany. To continue you good health, greetings from Madrid Wang. Our YouTube channel is popular around the world. United States, Australia, Hungary, Germany, Greece, Russia, Portugal, Italy, Singapore, Spain, New Zealand, China, etc.